To make sure your foods cook and bake perfectly, it is important to check that the temperature of your oven matches what you set it at. 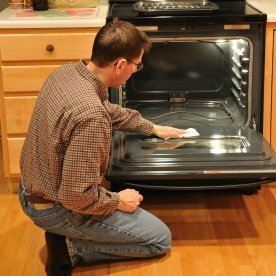 This guide is about calibrating an electric oven. Have you ever wondered why your cookies start to burn even though you followed the recipe exactly, or why your turkey took an hour longer to cook than it should have? Well, whether you use your oven a lot or a little, you should check your oven temperature every now and then to ensure the recipes you bake turns out perfectly. If your oven temperature is too low or too high, it can adversely affect the outcome of almost everything you bake. If you don't already have an oven thermometer, you can purchase one for a reasonable price at just about every local grocery or hardware store. Pull the oven temperature knob off from the stove top temperature control area. You may need to use a flat head screwdriver or butter knife to gently lift it off. The thermostat calibration dial will be located on the back of the knob. On the back of the knob there will be clips or screws locking it in place. Loosen these clips or screws and adjust the dial as needed to increase or decrease the temperature. For most electric ovens the dials have slash marks or it 'clicks', and each mark or click is for 10 degrees and you should be able to see the words 'low' on the left of the slashes and 'high' to the right of the slashes or a '+ or -'. Adjust accordingly and put the clips or screws back in place and the knob back on the stove top control shaft. Turn the oven back on and re-test the oven again for a half an hour to see the oven's temperature adjustment difference. If the oven thermometer still does not read 350 degrees F, adjust the calibration dial again and re-test the oven until it is at as accurate of a temperature as possible. If you have a newer electric stove without the dials, you will need to look at your user's manual to find out how to calibrate. Old manuals are commonly available on the manufacturers' website. I have problems with temperature control in my small oven. I have to cover with foil for part of the baking time and also turn temperature down 25 degrees. I still have problems, like burned or overcooked sides of brownies. Ovens designed for use in the home are rarely accurate. They simply are not manufactured to the standards of commercial products. Your best solution is to purchase an oven thermometer and leave it in there. They usual sit or hang on your oven rack. You can get one for less than $20 at just about any department or housewares store. Then you will always know what temperature your oven actually is.